The fact that you didn't pick this up on your last trip to Napa is our little secret. Adding a note of rustic charm, each is one-of-a-kind, custom-printed for you. The top is crafted from an authentic American white oak barrel head mounted on a smooth rotating rail, so that you can serve in style. The fact that you didn't pick this up on your last trip to Napa is our little secret. Adding a note of rustic charm, each is one-of-a-kind, custom-printed for you. The top is crafted from an authentic American white oak barrel head mounted on a smooth rotating rail, so that you can serve in style. Can the tray come without the lazy Susan part? BEST ANSWER: It comes with it attached, bit looks easy enough to take off with just a screwdriver. Is the personalization engraved into the wood or painted on surface? Some comments say it was screenprinted. BEST ANSWER: Not for sure but either painted or appliqué. Hard to tell. Definitely not carved or engraved. It is engraved and then filled with ink for a fine finish. It was screen painted with a clear lacquer over it. It is not engraved, I think stencils were used. This lazy Susan has a 21'' diameter. can you customize the logo? If I have a ranch logo, can it be incorporated in the design??? BEST ANSWER: Thank you for your inquiry. Actually, there is no assembly required. It was an error and the note has been removed from our site. Thank you for pointing this out to us. Any further questions you have, please reach out to us at 800 356 8466. Thank you again! I love this item! It is so fun to have it personalized. I bought a piece of glass to protect the design. The first one we ordered was not acceptable, we called and sent pictures. It was replaced without hesitation. We are SO very please with the customer service we received. We plan to do much future business with you! very nice piece especially when customized. gave this as a Christmas present to my wife. she loves it. we have it at our bar next to the pool table. it is awesome. wish it was engraved vs being screen printed. I'm very happy with this item. The quality is quite good, better than what is pictured on the web site. I liked being able to personalize it to my taste, and used the above quote as the last line. Received many compliments on it from our guests. Purchased the lazy Susan as a gift. Nice product, personalization made it special. I purchased this as a gift late in the Christmas season. It arrived on time and it was beautiful. My friends loved it. Service was great from the Wine Enthusiast staff. I would recommend it. Great gift for yourself or anyone! I bought this as a gift and they loved it. Several people wanted to know where I got it so they can purchase one for themselves! I gladly told them Wine Enthusiast!! 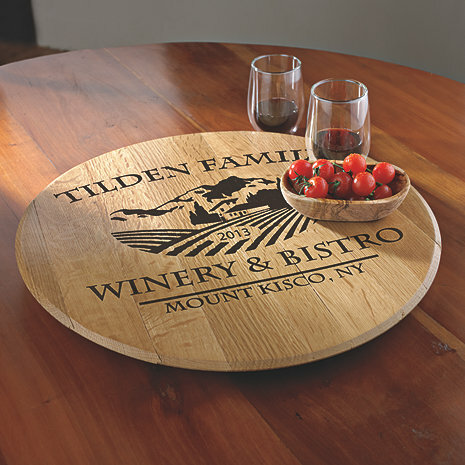 Bought for my Sister and Brother-in-law personalized for their beach house "Winery & Bistro". They absolutely love it. This Christmas gift was thoroughly enjoyed by the recipient. It is unique, yet personable and fits into their life style perfectly. I was quite satisfied with the promptness of delivery as well as the quality of the engraving. Cudos to all! The lazy susan wasn't well packaged when shipped. Too hard dot return. Big scratch from one side to the other on the front art side. Everything else is very nice.